Odds are, one of the first things you'll try to do in GarageBand for Mac is trim a track. 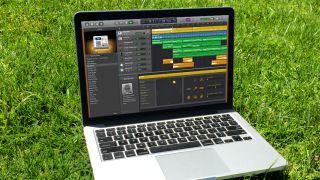 Good news: it's super-duper easy, whether you want to chuck a chunk of audio or tweak a clip's starting or stopping point. First, click on the clip you'd like to edit (its frame will lighten to confirm your selection). If you want to cut the clip in two, click and drag the playhead to the spot you'd like to split it at and press Command + T. Voila — one clip becomes two! If one part is trash, highlight it and press the Delete key. Position the playhead where you'd like to split the clip. And that's it! Now all you need is an amazing song or podcast to edit. Get to work! BONUS TIP: To find the perfect place to trim, it helps to zoom in closer (using the slider in the upper-right corner) for a good look at the waveforms (those squiggly lines that represent a clip's audio content).